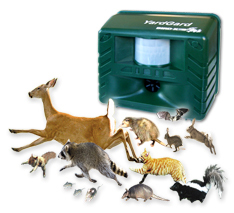 The Yard Gard Ultrasonic Repeller is ideal for cat control. Dial the cat setting and plug it in. The ultrasonic sound environment is intolerable to cats. 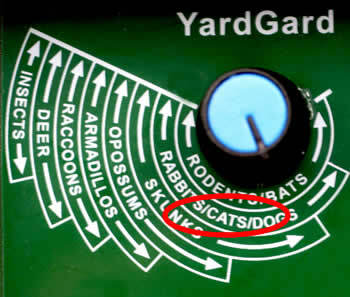 Cats are repelled away from the Yard Gard Ultrasonic Repeller because they cannot adapt to the constantly changing array of ultrasonic signals emitted by this device. Don't mess with chemicals or messy sprays. We've experienced great results with this unit.Laboratory tests have proven this yard protector is highly effective for pest control. This electronic yard protector uses adjustable, powerful ultrasonic sound waves to repel cats, cats, deer, rabbits, raccoons, opossums, armadillos, skunks, bats, rodents and other creatures. We purchased this item for cats. Our neighbor has about eight cats, some of which are strays. They would constantly come over and use our yard and front porch as their potty. We purchased the Yard Gard and it works FANTASTIC. The cats are no longer coming over and our neighbor is also pleased.